These days’ people and companies want things done as quickly as possible. We live in an age where a lot of things happen instantly on the internet, and we have come to expect speed when it comes to the real world. This is why modular offices have been developed as they cut down on the time it takes for a business to have a fully working office put together. As they require no foundations, construction of a modular office can be completed quickly enabling a business to use it within a short space of time. They can also be delivered fast, and the shipping office price compared to that of a bricks and mortar office can result in really big savings. A modular office can be used as a permanent structure, or as a temporary area while a more solid office is constructed. Many companies opt to have them as permanent offices though due to the reduced costs involved. 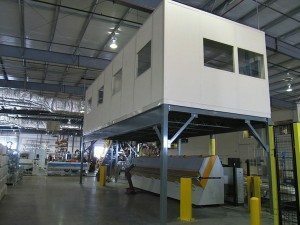 Not only can these structures be supplied pretty much off-the-shelf in, but they can also be used as storage rooms and as units that provide temporary walls. Shipping office structures of this kind are very easy to build due to the compact nature and simplicity to them. There is no waiting around for different materials to arrive as with bricks and mortar building, everything required to construct the office all comes together. As well as being used inside buildings for more office space, they can often appear as portable structures frequently seen on building sites. They are very convenient for this purpose as the staff need somewhere to work while they are constructing whatever it is that they are being paid to do. 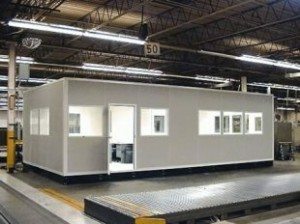 There are a number of benefits when it comes to having modular offices, and these are listed below. Flexibility – If you were to build a bricks and mortar office and then decided you needed to add to it in the future, it can be a lot of hassle. Adding extensions to a modular office is very easy and can be done in a short space of time. These buildings can also be quickly taken down and moved if the need arises. Wastage – When building something with bricks there is often a lot of waste as you can never order the exact amount of all of the materials that are required. When it comes to the modular kind then wastage is massively reduced, in some cases by as much as 90%. Greener – With many more businesses looking for ways to help reduce carbon emissions, having the office shipped from the one place cuts down on the amount of fuel used. Compare that with having cement, wood, bricks, and windows all delivered separately. Buying a shipping office for sale can certainly help offset the carbon gases that would have been released into the atmosphere. Delivery – When an order is placed for these modular buildings then 99.9% of them are delivered on time. There is no worry about having to find builders, glazers and carpenters. Disruption – As these offices come ready to be put together in a much shorter time than a solid building, the disruption it causes to a business can be reduced by 50%. As a lot of the parts needed for these offices are already available, from the time the order is placed, to construction of the remaining parts, the whole thing can be delivered within 2 working days. The quick turnaround does not mean a reduction in quality, it is just that the manufacturing process has been perfected. This is how the shipping office price is kept low. With the financial climate having squeezed a lot of businesses since the collapse in 2008, more and more of them have switched to using modular offices in order to save costs. With the shipping office price allowing companies to save money on office space, it has allowed them to invest elsewhere in the business. Now with the world slowly climbing out of the financial mess that it found itself in, more companies are finding that they can now get their hands on more finances in order to grow, and modular offices can help them do that.